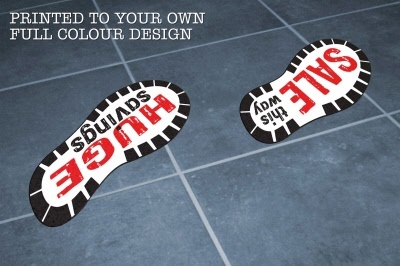 Grab your customer's attention with this Eye Catching, Indoor Shoe Print Shape Floor Graphic. Floor Sticker comes with the our with the wording "SALE - this way" and "Huge Savings". Change the text, colour or add your logo for FREE. Artwork requested via email once the order has been placed. Floor Graphic is made from Peelable Non Slip Vinyl for Long Term Indoor Use (up to 12 months, subject to footfall) or Permanent Non-Slip Vinyl for Short Term Outdoor Use (up to 6 months subject to footfall). Minimum Online Order Quantity 5 Pairs. Scratch Resistant, Water Proof, ideal for long term indoor use or up to 6 months outdoor use. Graphics are ideal for In store Promotions & Events.